How do you clear land? All I can see is adjusting between pasture and farmland. If you increase the amount of pasture, it clears wilderness automatically. If you need to increase pasture without clearing the wilderness for some reason, you decrease the amount of farmland(although there's only a few reasons you'd ever need to do that). Goal for this year: FIX EVERYTHING. Also explore a little if we have time. 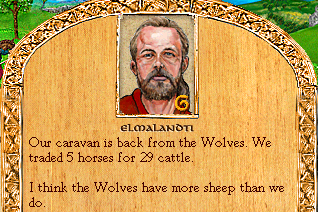 Elmalandti, I think everyone has more of everything than we do. 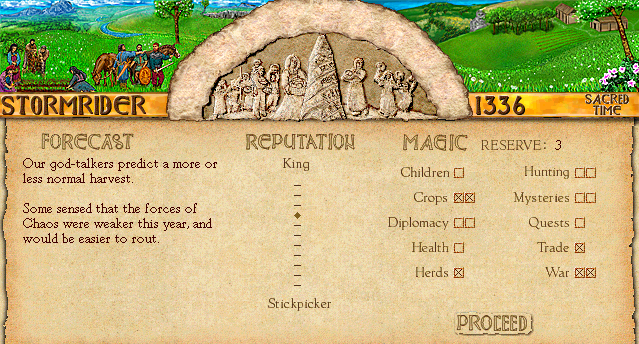 Holy mass culling of old nobles! 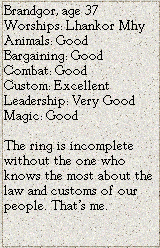 Vandarl was our lawspeaker, so I'm going to have to rearrange the ring. 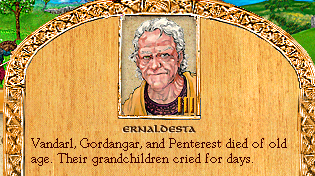 As for the other two: Gordangar was that guy I kept sending out to explore, and I have no idea who Penterest was. Lawspeakers are basically interchangable(they even tend to give the exact same advice since they're so focused on the letter of the law and tradition), so I didn't bother you guys with the replacement decision. Say hi to Brandgor, our new know-it-all man! Warriors from the Vostang clan have snuck onto your tula and killed one of our carls, Markalor. They identify themselves as Garstal and Yerestia, and let Markalor's son go so that we would know they did this to avenge their brother-in-law Brandig, who had been killed in a raid by Markalor's cousin, Hiord. -Insist that the Vostangi outlaw the killers. -Send weaponthanes to kill Garstal and Yerestia. -Send weaponthanes to kill one of their relatives. Just how many Garstals are there running around Dragon Pass? First there was whatshisface's burned to death dad, then there was one of the guys we outlawed for adultery, and now this! Orlanth established the first wergilds. But he himself often chose vengance instead. We have good grounds for a legal case, but we'd be unlikely to prevail if we pressed for outlawry. 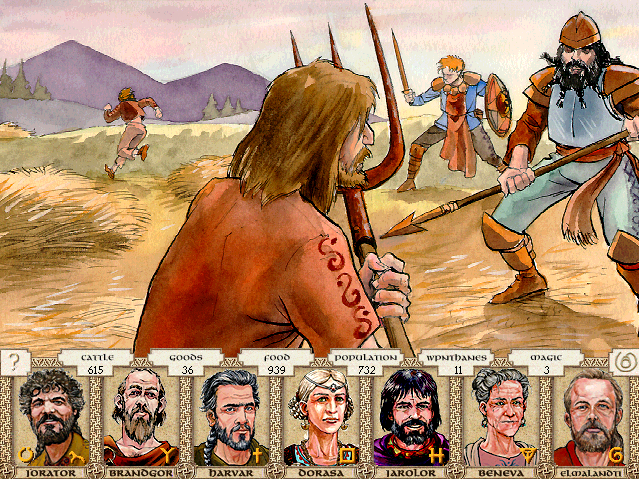 The easiest way to manage Markalor would be to strike at the kinsmen of Garstal and Yerestia - especially since the Vostang forces outnumber us. We cannot let Markalor go unavenged. Neither killing nor blood-price will bring back Markalor, but we should accept the latter to avoid making things worse. A raid in planting season is folly, yet the carls look to us to do something.